Just yesterday On June 23rd, the City of San Francisco signed into effect the nation’s first law mandating that all residents and businesses separate their recycling and compost material from normal trash. While many other cities in the US require recycling, no other city requires separation of food scraps and foot material to be composted. The measure, which will take effect this fall, is intended to help increase landfill diversion rates to 75% by 2010 as well as reduce greenhouse gas emissions. San Francisco is already well known for it’s impressive recycling and participation rates. The city diverts 72% of it’s trash from the landfill, and if everyone in the city participated in the new mandate, the Department of the Environment expects they could reach a 90% diversion rate. Ultimately though, the city has a goal of zero waste by 2020. The Department of the Environment conducted a study and determined that 36% of what is sent to the landfill is compostable and 31% is recyclable, most of which is paper. 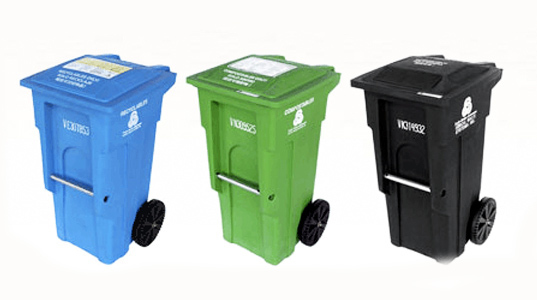 Every residence and business in the city will be expected to have 3 different color-coded bins to separate their trash: blue for recyclables, green for compostables, and black for the remaining trash. Residences and businesses that cannot comply with the mandate can write the city a note explaining why it is unfeasible. The purpose behind the mandate was to encourage businesses and residents who currently don’t recycle to start participating. 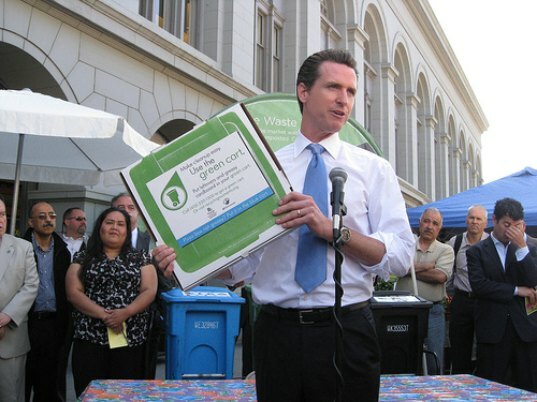 San Francisco Mayor Gavin Newsom wants to “get recycling and composting happening in buildings where it is not currently provided.” And while there are fines associated with noncompliance of the recycling and composting ordinance, fines are not expected to be handed out except in extreme cases. The potential for fines is meant to increase awareness and add a sense of urgency to the matter, but they will only be implemented after repeated notices and phone calls. Additionally, a moratorium on fines is in effect until 2011.
hows it goin folks, id like to say hi and wanted to start a new post because im a newbie looks like ill have some interesting subjects.. I wanted to start a forum on toys that were most memorable in their childhood. Anyone want to share any of them? hi, im new here and just wanted to say wats up for know Thats all i wanted to say for today and ill probably go to some excersise right now. We only want the only the best of our boy. We were wondering if you guys could help us out any way you can. My pet needs the tastiest food to maintain a healthy lifestyle by a nutritional diet. How would you like to try a burrito that will melt in ur mouth, and will satisfy every fiber of ur being? Ya wouldn't that be great? GO TO MEXICO!! The best burritos in the world!! THE MAN BEHIND THE CURTAIN Any of Newsoms little twitterlings who have been hoodwinked by his slick PR campaign would be well advised to dig a little deeper. A good place to start might be the article "The Two Newsoms" by Steve Jones at SF Bay Guardian. The last thing we need is a second class Schwarzenegger. Dont get fooled again. Patrick Monk.RN. Noe Valley. EF. Revolution Corp, I don't know that sorting is practical for modern recycling. It was fine when all you could recycle was soda bottles and the morning newspaper, but with various types, shapes, and colors of plastic, I just don't think it's realistic. And I do think -- required or not -- participation will always be higher if sorting is not required. scorn, The landfill is public. Why should you be able to waste perfectly good space with biodegradable or recyclable material? (Or, for that matter, waste the material.) I'm not saying we need to throw people behind bars for throwing out their plastic bottles, but I absolute support mandating recycling. I had asked how much fuel is required for trucks to go and collect this material for composting? Wouldn't it be better to layer it all out evenly on your own property or to bring it to some open space? What wrong with returning glass bottles to stores? Plastic bottles should be forbidden by law.Let me see sf pass a law forbidding anything from being sold in a plastic container. If this expansive recylcing program is going to work - it will be in San Francisco. Let's hope it takes off and spreads across the country! I have nothing against people composting and recycling, however I do believe it is outrageous that it is being required. When was government given the right to control what we do with out garbage. I just don't believe that this is something that should become a law, nor should it be mandatory for people to compost their food. Helping the environment is good, but people should still be given a choice in how they go about doing so. Just yesterday On June 23rd, the City of San Francisco signed into effect the nation's first law mandating that all residents and businesses separate their recycling and compost material from normal trash. While many other cities in the US require recycling, no other city requires separation of food scraps and foot material to be composted. The measure, which will take effect this fall, is intended to help increase landfill diversion rates to 75% by 2010 as well as reduce greenhouse gas emissions.